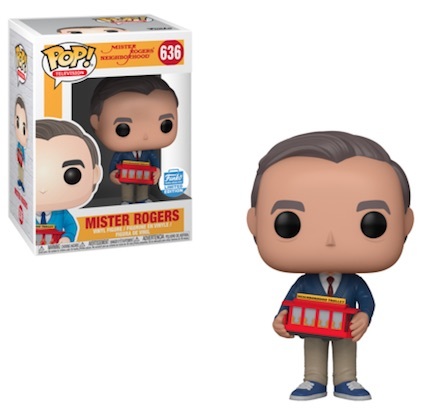 Everyone's favorite neighbor transitions to vinyl with Funko Pop Mister Rogers! Featuring the beloved star of Mister Rogers' Neighborhood, the Pop! Television set offers several figures for Rogers wearing different sweaters and holding items from the show. Fred Rogers, the PBS icon who delighted viewers for 31 seasons, is unmistakable, even in vinyl form. The primary figure (#634) poses Rogers in a green sweater and dark gray slacks as he carries the red "Neighborhood Trolley" train. The Funko Shop exclusive contains the trolley, as well, but switches to a blue sweater that matches his blue shoes, khaki pants and blue tie. 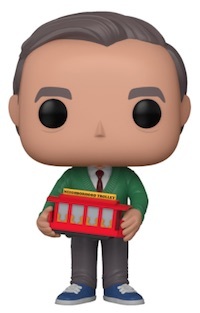 Shop Mister Rogers Pop! figures on Entertainment Earth. 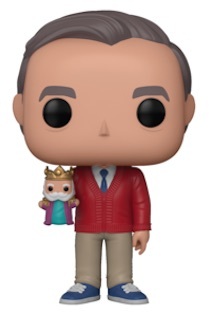 Only available at Barnes & Noble locations, Mister Rogers also comes in a red sweater while holding the King Friday XIII puppet. Staying true to his on-air appearance, all the figures present Rogers with his perfectly combed gray hair. The Funko Pop Mister Rogers figures are joined by a SuperCute Plush and Pop! Pocket Keychain for Mr. Rogers. Mister Rogers PBS T.V Show POP Vinyl # 634 Mister Rogers Neighborhood Funko ! Click on the images or listings to shop for figures on Amazon or eBay when available.